Trigger finger is a "snapping" or "locking" condition of any of the digits of the hand when opened or closed. Trigger finger is medically termed stenosing tenosynovitis. Symptoms of trigger finger may occur when any of the four fingers of the hand attempts to flex closed while gripping. Instead of a smooth, continual closure, the digit hesitates, then snaps closed. When attempting to extend the digit, a similar hesitation may occur before it "snaps" into full extension. In severe cases, the digits must be manually brought into full extension or flexion. The closure is frequently associated with pain at the base of the digit on the palm of the hand. Triggering can also affect the thumb. 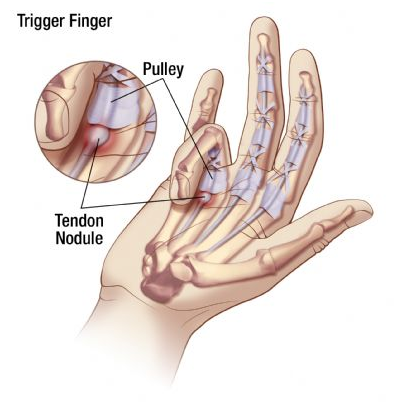 Trigger finger is caused by local swelling from inflammation or scarring of the tendon sheath around the flexor tendons. These are tendons that normally pull the affected digit inward toward the palm (flexion). Usually, trigger finger occurs as an isolated condition because of repetitive trauma. Sometimes, trigger finger is an associated condition resulting from an underlying illness that causes inflammation of tissues of the hand, such as rheumatoid arthritis. In fact, data presented at the 2005 American College of Rheumatology national meeting suggested that a majority of patients with rheumatoid arthritis have inflammation around the tendons of the palm of the hand that could develop into trigger finger. Stretching, ice, and anti-inflammation treatments can be helpful. Oral anti-inflammatory medications that may be helpful include naproxen, ibuprofen, diclofenac, and others. The quickest and most effective treatment is a local cortisone injection into the tendon sheath around the affected tendon. Most patients will respond positively to the cortisone injection, but this may only be a temporary response. When a trigger finger persists after two injections and is not responsive to the above treatments, surgical procedures to release the tendon sheath and/or remove the inflamed or scarred tissue are considered. Surgical intervention is usually a permanent cure for this condition. For more information about damages that may be available in your musculoskeletal injuries claim, please call The Maurer Law Firm, PLLC, today at 845-896-5295 to discuss your case for free.